When I think about API Analytics, I like to think about the "Goldilocks Question". This question is "Who's been using my APIs?". One of the tests of an API Analytics solution is how easy it makes it to answer this question. 1) Look at an API and see what clients are using it. 2) Look at a client and see what APIs they are using. Let's look at these two scenarios. I've used a vehicle telematics scenario, where two clients ("SUV" and "Sports Car") are accessing two different APIs ("Vehicle Control API" and "Engine Metrics API"). 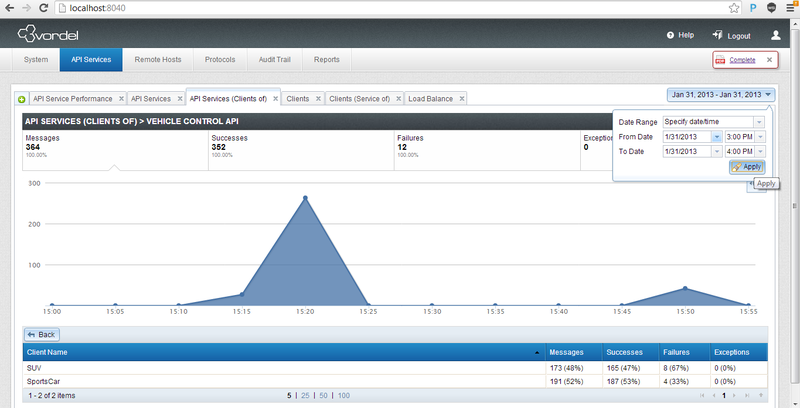 The screenshot below shows an API ("Vehicle Control API") during a time period: 3pm to 4pm on January 31 2013. We see the number of request to this API from each client. The client "SUV" has made 173 to the Vehicle Control API. 165 were successes. 8 were failures. I also clicked on the "PDF" button to create a PDF of this same report. This can also be automatically generated on a regular scheduled basis and emailed. The screenshot below shows how many API requests a particular client ("SportsCar" in this case) makes to each API. In this case, it is between 3pm and 4pm on Jan 31. The client made 194 requests to the "Engine Metrics API" during this time. 192 were successes and 2 were failures. Again, can also click on the "PDF" button to generate a PDF of this information. Or, you could schedule this PDF to be created (e.g. for the previous 24 hour period) and automatically emailed. In this using the Axway/Vordel API Analytics, which comes with the API Server, you can answer the "Goldilocks Question" and see exactly how your APIs are being used.